The slides following provide a brief summary of releases authored by Michael O’Connor. The latest release is titled Perceptive Sensations and includes original art, prose and photography. Links to Michael’s works can be found at www.bhamamp.com including other multi-media examples. Michael is finishing up his latest project that will include eTheatre methods and techniques. This new release is scheduled for the second half of 2012. 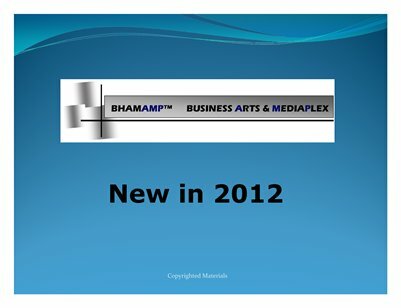 BhamAMP is also operating as a vehicle for designing and implementing of multi-media biographies for start-up companies and individuals. Design inquiries can be sent to bhamamp@gmail.com.